Forget the back row... a London cinema has installed double beds in its front row. 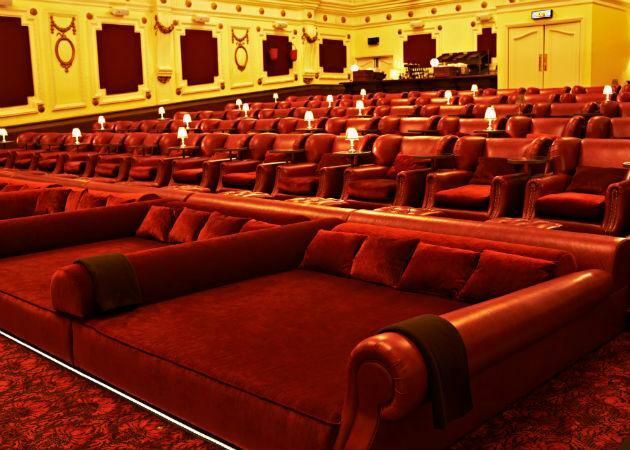 The Electric Cinema in Notting Hill has torn out the row of 14 chairs and replaced them with six upholstered double beds as part of a £5 million refurbishment of the 102-year old venue. For added luxury, couples can now book the beds and watch films under a cashmere throw rather than go for the traditional stalls. “There used to be smooching in the back row, now there will be smooching in the front row under a blanket,” said Nick Jones, founder of the Soho House group, which owns the grade II listed building. The cinema, on Portobello Road, closed in June this year after a fire, and has now reopened following the extensive refit. It has long been regarded for its luxury, with leather seating, footstools, tables for food and drink and two-seater sofas. The bed tickets, which are cheaper because they're on the front row, are to be sold in pairs for £18 per person, compared to £20 per person for regular tickets. But customers thinking that the new beds are an invitation to misbehave would be doing so in view of the rest of the house. “We’ll have to keep an eye on that,” Jones told the Evening Standard.